Some governments recognise Yangon (Rangoon) as the national capital. Road infrastructure is still for driving on the left. Myanmar is a country in South East Asia. Its full name is the Republic of the Union of Myanmar. It is also sometimes called Burma. Myanmar is the largest country in Southeast Asia that is not an island. It is also part of South Asia. 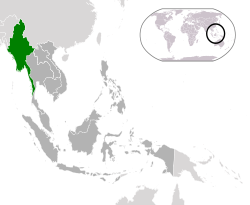 It is bordered by China on the north, Laos on the east, Thailand on the southeast, Bangladesh on the west, and the India on the northwest, with the Andaman Sea to the south, and the Bay of Bengal to the southwest. There are over 2,000 kilometres (1,200 mi) of coastline. In 1989, the military junta officially changed the English version of its name from Burma to Myanmar. It also made a new name in English for places in the country, such as its former capital city, from Rangoon to Yangon. The official name of the country in the Burmese language, Myanmar did not change, however. The renaming was controversial, seen by some as linguistically bad. Accepting the name change in the English-speaking world has been slow, with many people still using the name Burma to refer to the country. Major news organizations like the BBC still call it Burma. Some question the military junta's authority to "officially" change the name in English in the first place. Aung San Suu Kyi, however, calls the country Myanmar now. Wikimedia Commons has media related to Myanmar. ↑ "Asian Development Bank and Myanmar: Fact Sheet" (PDF). Asian Development Bank. 30 April 2012. Retrieved 2012-11-20. ↑ "The World Factbook". Cia.gov. Retrieved 2013-07-06. ↑ "The World Factbook – Burma". cia.gov. Retrieved 1 September 2012. ↑ 6.0 6.1 "Myanmar swears in first elected civilian president in 50 years". BBC. 30 March 2016. Retrieved 30 October 2016. This page was last changed on 21 March 2019, at 21:45.